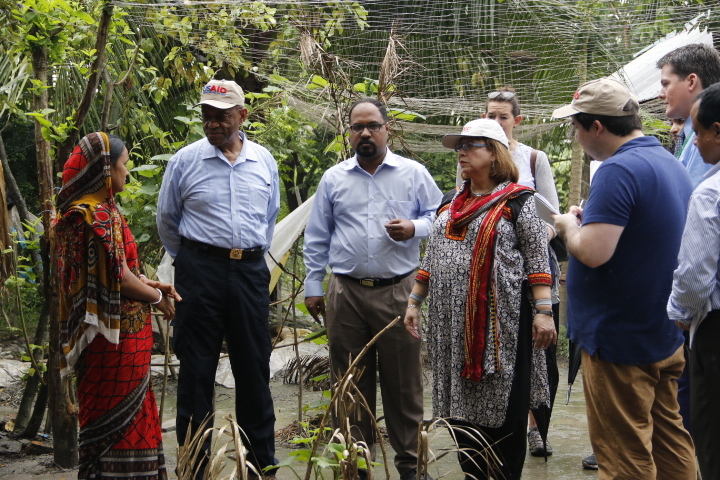 In August, The Acting Administrator for USAID, Mr. Alfonso E. Lenhardt, visited a SPRING/Bangladesh Farmer Nutrition School (FNS) in Mulghar Union of Fakirhat Upazila in Bagerhat District. He was accompanied by the USAID/Bangladesh Mission Director, Ms. Janina Jaruzelski, and Ms. Sinu Kurian and Dr. Iftekhar Rashid from USAID/Bangladesh. The VIP group also toured a Community Clinic. The SPRING-led FNS is a fortnightly training activity in which pregnant and lactating women with children under the age of two in the two poorest wealth quintiles participate over the course of nine months. The discussions all focus on nutrition and hygiene, but the information is presented in the context of vegetable gardening, native chicken rearing, and pond fish culture for improved diet and better nutrition at the household level. During the delegation’s visit, one FNS participant, Ms. Aporna Shikder, was profiled; she is the village’s community nutrition champion and her story can be read here. The delegation also met other members of Kathalbari village and learned about their experiences participating in a SPRING FNS. The VIP delegation also spoke with a health assistant and a community health care provider at the Foltita Community Clinic in Mulghar Union. 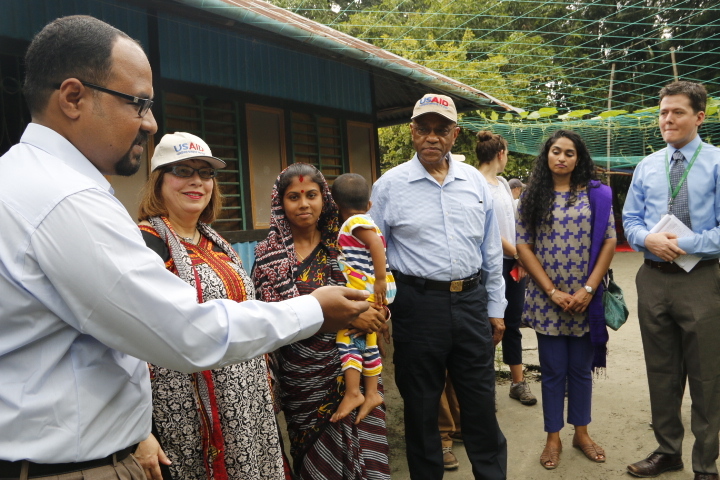 The delegation saw group nutrition counseling and had a chance to learn about how these facilities are now able to better deliver quality nutrition counseling to mothers and children thanks to support from the Goverment of Bangladesh and SPRING. Since March 2012, SPRING has been in Bangladesh, working directly with more than 100,000 women in 40 sub-districts (upazilas) of Khulna and Barisal divisions. SPRING has a tripartite agreement with the National Nutrition Services and the Revitalization of Community Health Care Initiatives in Bangladesh project and is closely aligned with the Scaling Up Nutrition (SUN) movement, as well as the Government of Bangladesh and USAID strategies for improving nutrition.